Space-filling curves are continuous surjective functions that map the unit interval [0,1] to a higher-dimensional region, such as the unit (hyper-)cube. They are usually based on a recursive subdivision of the higher-dimensional region into smaller tiles of similar shape, together with a definition of the order in which these tiles should be traversed by the curve. ed mapping f from the unit interval to the unit square. For example, f(6/64) would be the point that is reached by the curve when it completes the traversal of the sixth cell in the grid of 8×8=64 cells that results after three levels of subdivision (the red point in the figure). A space-filling curve can be used to define an order in which to store or process points, grid cells or other objects in a square or in a higher-dimensional space: we simply process these objects in which we encounter them when we follow the curve. Space-filling curves are used, for example, in databases for multidimensional data, computations on large meshes, and rendering of computer graphics. The beneficial effects of ordering objects along space-filling curves often stem from their locality-preserving properties: consecutive elements in the curve-induced order tend to lie close to each other in space, and vice versa. However, not all space-filling curves are equally effective at optimizing, for example, the disk access patterns of queries in multidimensional databases. In our research, we study different curves and we analyse them using abstract quality measures that are derived from the intended applications. Moreover, we try to find new curves with desirable properties. My work in this area can be divided into three main categories: (1) exploring combinatorial possibilities for space-filling curves, (2) finding space-filling curves with optimal qualities with respect to certain applications, and (3) representations of space-filling curves, currently, in particular, by sound. At the end of this page you will find a fourth category, bycatch: some nice curves and tessellations which I stumbled on accidentally in the course of my research. The following paper describes several space-filling curves and non-continuous space traversals for cubes and simplices in any number of dimensions, and lists a number of open questions in this domain. 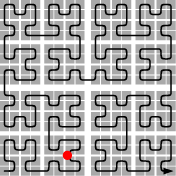 Sixteen space-filling curves and traversals for d-dimensional cubes and simplices. Computing Research Repository (arXiv.org), 1711.04473, 2017. The following paper discusses what possibilities there are for constructing three-dimensional octant-by-octant self-similar cube-filling curves, and what distinct properties the different solutions have. A limited discussion of four-dimensional curves is included as well. The paper comes with a prototype for a software tool to explore the curves. Journal of Computational Geometry, 8(1):206-281, 2017. For entertainment, you may take a look at my labyrinth-style renderings of some three-dimensional Hilbert curves. An inventory of three-dimensional Hilbert space-filling curves. Computing Research Repository (arXiv.org), 1109.2323, 2011. Reptilings and space-filling curves for acute triangles. By Marinus Gottschau, Herman Haverkort, and Kilian Matzke. Discrete and Computational Geometry, 60(1):170-199, 2018. No acute tetrahedron is an 8-reptile. I have studied space-filling curves mostly in the context of optimizing three-dimensional mesh traversals and spatial data structures. 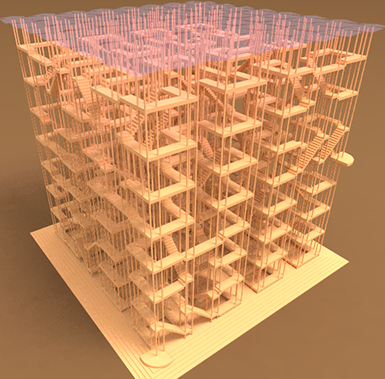 Physical processes are often simulated by computations on meshes. A mesh can be understood as a subdivision of physical space into cells of different sizes, depending on the required precision. The simulation proceeds by making several passes over the mesh, each time visiting all cells and updating values stored with its vertices, edges, faces and cells. Space-filling curves, or more generally, recursive traversal orders, can be very useful to organize data transfer, load balancing and mesh refinement in such applications. The following presentation gives an overview of the relevant properties and quality criteria of recursive traversal orders, and presents some results about which combinations of desirable properties can be achieved. Space-filling curve properties for 3D mesh traversals. Presentation at Int. Conf. on Parallel Computing ParCo 2013. Specifically, as explained by Bader, palindromic mesh traversals can be used to organize finite-element and finite-volume computations on meshes such that all storage of intermediate results can be handled by push and pop operations on a small number of stacks. In three dimensions, the Peano curve, based on subdividing cubes into 27 subcubes, is palindromic. I found that there are discontinuous palindromic traversals based on subdividing cubes into only 8 subcubes, and based on bisecting certain shapes of tetrahedra. There are no face-continuous solutions that follow any known recursive subdivision of cubes or tetrahedra into eight similar parts (see the aforementioned presentation; unfortunately I have not found the time to write this down properly yet, but feel free to contact me for further details). My student Gert van der Plas worked out the discontinuous palindromic tetrahedral traversal in detail. Unfortunately, the rules for which vertices to put on which stacks are quite complicated. I still hope to find some time to write a piece of code demonstrating how it works, also for an adaptive mesh (if there is no unexpected catch). Feel free to contact me to remind me of this plan or to offer your help in trying to simplify the rules. The Arrwwid number of a space-filling curve is the smallest number A, such that any ball with volume B can be covered by A contiguous pieces of the curve of total size O(B). Arguably, sorting points along space-filling curves with low Arrwwid numbers makes for data structures that can be queried efficiently: they would allow any range query with a ball to be answered by scanning only A relatively small sections of the data structure on disk, inducing only A seek operations. In the following paper we study curves with small Arrwwid numbers, and lower bounds on the smallest possible Arrwwid number, in two and more dimensions. Recursive tilings and space-filling curves with little fragmentation. Journal of Computational Geometry, 2(1):92–127, 2011. A space-filling curve f preserves locality well, if, for any a and b in [0,1], the points f(a) and f(b) (and maybe also the points f(c) for c∈[a,b]) lie, according to some distance measure, close to each other, relative to b−a. In the following paper we develop a technique to calculate how well a given space-filling curve preserves locality, and we prove some lower bounds on certain locality measures for certain types of space-filling curves. Locality and bounding-box quality of two-dimensional space-filling curves. In my papers on three-dimensional Hilbert curves (see above), we explore locality properties of generalizations of Hilbert's space-filling curve to higher dimensions. The paper mentioned below presents d-dimensional “Hilbert” curves, for any d ≥ 2, with the following property: the size of the minimum axis-aligned bounding box of the points f(c) for c∈[a,b] is never more than 4(b−a). In contrast, with commonly used generalizations of Hilbert curves, the worst possible ratio between bounding box size and (b−a) depends exponentially on the number of dimensions d.
By Arie Bos and Herman Haverkort. Journal of Computational Geometry, 7(2):145–190, 2016. We can define extradimensional space-filling curves approximately as follows: a D-dimensional space-filling curve F, filling a D-dimensional hypercube U, is extradimensional to a d-dimensional space-filling curve f if, for any d-dimensional face u of U that contains the origin of the coordinate system, the order in which the points of u are visited by F is the same as the order in which these points are visited by f when rotated onto u. For example, some high-dimensional Hilbert curves have the property that the points on most sides of the D-dimensional cube are visited in the order of a (D−1)-dimensional Hilbert curve. In the following paper, we show experimental evidence that four-dimensional space-filling curves that are, to some extent, extradimensional to two-dimensional space-filling curves, can be useful in building data structures (R-trees) that store rectangles in the plane. Harmonious Hilbert curves and other extradimensional space-filling curves. Computing Research Repository (arXiv.org), 1211.0175, 2012. It is hard to draw figures of space-filling curves in three dimensions, and almost impossible to draw figures of space-filling curves in four or more dimensions. I am currently exploring illustrations by means of sound as an alternative. The sound tracks (or the process of creating them) sometimes help to understand the curves better, and at the same time, they seem to provide some insights into characteristics of musical sound. For entertainment, you may also check out my labyrinth-style renderings of some three-dimensional Hilbert curves. Three pretty simple plane-filling curves: three intricate curves, filling beautiful fractallic 3-reptiles, that are obtained by small changes in the definition of the Peano curve. D. Hilbert: Über die stetige Abbildung einer Linie auf ein Flächenstück. Mathematische Annalen 38:459–460 (1891). Points close together along the curve are also close to each other in space.